Coopervision Frequency line of contacts is designed to assist the patient with high definition vision through addressing unique refractive errors such as high myopic (near-sightedness) prescriptions, high hyperopia (far-sightedness) prescriptions, astigmatism and presbyopia. 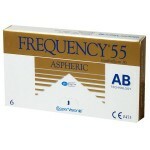 The aspheric design of the Frequency 55 brand of lenses allows the contact to have less radius of curvature. This translates to a wider field of view for the patient, a more focused optical center and better comfort along the peripheral edge of the contact. This is particularly important to patients with higher prescriptions since field of view maybe somewhat limited in a spherically designed lens. 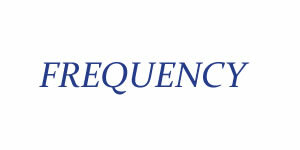 The Frequency 55 Multifocal has a Balanced Progressive™ Technology which assigns correction to different zones taking into account eye dominance. This balanced approach allows the patient to have sharp vision at different focal lengths no matter what degree of presbyopia. 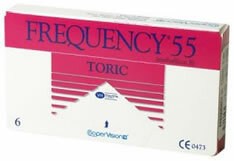 Fitting toric lenses for astigmatism is critical with respect to good visual acuities for the astigmatic patient. 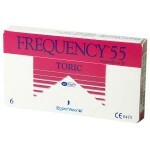 Frequency 55 Toric lenses are available in a wide range of fitting parameters to accommodate a variety of steep or flat corneas. 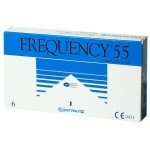 Made with methafilcon A, Frequency 55 Toric lenses are also designed to stay moist during the course of the patient’s wearing time. The ability of these lenses to keep the surface of the cornea fluid prevents complications typically associated with dry eye syndrome and contact lens wear. This fluid environment prevents the build-up of denatured proteins, allergens and bacteria which are primarily responsible for infections and non-refractive visual complications.